Manhattan Beach is well know for it's beach front homes that are located in front of boardwalk. 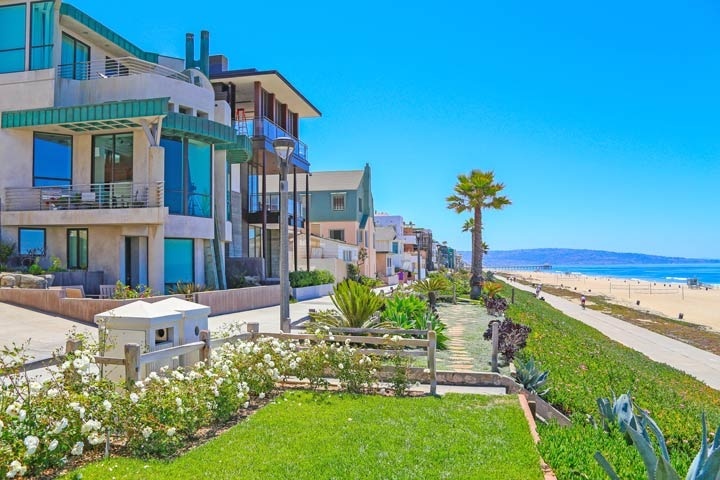 The homes are located on the ocean front street known as "The Strand" which are elegant homes that offer breathtaking views of the Manhattan Beach Pier area and coastline. The Strand is predominately single family homes with a mixture of some residential town homes. These properties rarely come on the market for sale and are often sold before they officially come on the market. These beach front homes are some of the most expensive real estate in the Manhattan Beach area with real estate prices starting in the low two million dollar range and going as high as twelve million dollars. Townhomes have recently sold in the mid $1.5 range for a two bedroom unit right on the beach. Below are all the beach front homes for sale in Manhattan Beach including beach front condos. Please contact us with any questions and to schedule a showing for you today. Based on information from California Regional Multiple Listing Service, Inc. as of April 23rd, 2019 at 7:37am PDT. This information is for your personal, non-commercial use and may not be used for any purpose other than to identify prospective properties you may be interested in purchasing. Display of MLS data is usually deemed reliable but is NOT guaranteed accurate by the MLS. Buyers are responsible for verifying the accuracy of all information and should investigate the data themselves or retain appropriate professionals. Information from sources other than the Listing Agent may have been included in the MLS data. Unless otherwise specified in writing, Broker/Agent has not and will not verify any information obtained from other sources. The Broker/Agent providing the information contained herein may or may not have been the Listing and/or Selling Agent.